Any experienced marketer knows it costs more to acquire a new customer than to retain an existing one. The revenues generated from loyal, repeat customers will surpass those of large one-time customers. Not only that, loyal customers also help to increase your bottom line by recommending you to others. Therefore, cultivating a loyal customer base should be a priority for any business. 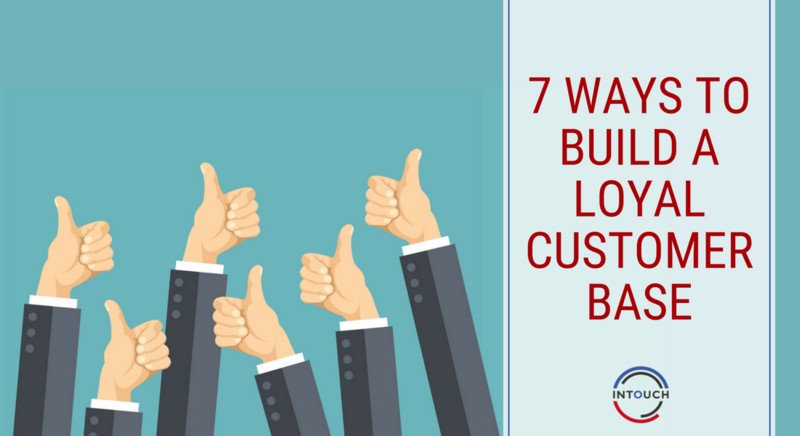 In this blog, we’re going to discuss 7 ways you can build a loyal customer base for your business. It is undeniable that customers remember a negative experience, but equally they remember when they have an outstanding experience too. A positive customer experience can result in repeat business; therefore, it should be at the top of your priorities when trying to build a loyal customer base. Customer experience starts at the initial contact with your staff. Are emails or calls promptly responded to? Does the customer get satisfactory answers? How friendly are the staff? How easy is it to locate and checkout on your website for online shoppers? How long do in-store shoppers spend on the queue? After sales support is also very crucial. How fast does a customer get a response on a faulty item? How easy is the return policy? Do you value their feedback These are all factors that are really quite simple but will make a huge difference to the experience your customer has. If what you offer to your customers is of incredible value, they should have no reason to look elsewhere. Different customers will have a different perception of value- one could see a huge value in the quality of your product or service and another could see huge value in the convenience it offers for example. If you can offer excellent value all round and you solve a real pain point for your customer, they will not question the price of it and they will continue to buy from you. Even if you offer outstanding service and incredible value, there is still a danger that your customer’s attention will be shifted to your competitors. However, by continually reminding them of your offering through regular lead nurturing emails, you will stay at the forefront of their mind and you’ll start to build a local customer base. We’re not suggesting that you email them every day with a new offer, but maybe once a week, send them an email that they will find valuable or entertaining but do not try to sell to them. These emails should be about keeping them engaged with your brand and not about closing another sale instantly. By pushing too hard for a repeat sale, you’ll only scare them off. Showing your customers that you value their custom by giving something back will go a long way to help you build a loyal customer base. There are various ways you can do this; offer discount, invite your top customers to an exclusive event or create a loyalty card scheme. By rewarding your customers for their loyalty and asking for nothing in return, they’ll feel appreciated and it’ll bring them even closer to your brand, encouraging them to stay. One bad experience can instantly ruin all the hard work you have put in to satisfy your customers and it can be extremely damaging to your reputation. However, we all make mistakes and it’s how we rectify our mistakes that really matters. If, for whatever reason, your customer isn’t 100% satisfied with your product or service, take responsibility, apologise and do all you can to correct it. 9 times out of 10, your customer will be forgiving and appreciate your effort in trying to rectify the situation. The importance of consistency in business cannot be underestimated. Offering an exceptionally good experience as a one off may build a short-term affinity with your customer but it will not build customer loyalty. To build a loyal customer base, you must provide a consistently good experience for your customers. As mentioned earlier, your service shouldn’t end immediately after the transaction has been made if you want to build a loyal customer base. After your customer has made a purchase, follow up with them a week later to check they are satisfied with the product or whether you can be of assistance to them. Ask for their feedback to show you value their opinion. A quick phone call can be the difference between a long-term customer and a one-off customer! So, there are 7 techniques you can try to help you build a loyal customer base. Cultivating a loyal following can ensure continuous success for your business and help you win sales time and time again.